This map from Gary Enn's petition to the Bakersfield City Council shows the few existing crosswalks across 24th St.
A Bakersfield neighborhood recently won a small victory for pedestrians in a city that has been called one of the deadliest of places for walkers. Residents who live in the Westchester neighborhood, near downtown, convinced the city council to keep a crosswalk that currently crosses 24th Street at Alder/A Street. The crosswalk, and another one at Drake/D Street, was slated for removal as part of a project that will widen and realign 24th Street. The crosswalk currently connects the north and south side of the neighborhood across the busy 24th Street corridor. City staff had called for both to be removed on the recommendation of the design consultant. The four lanes of 24th merge to three near that point, and they felt drivers would not have time to notice pedestrians in time to stop for them. Enns spearheaded a petition to save the crosswalk and rallied his neighbors to come to a public hearing on the subject on October 11. In a unanimous vote, the city council agreed with staff that both crosswalks should be removed—but also directed them to come back with a design for a better crosswalk at or near Alder/A Street. Enns called it a bittersweet victory. Westchester residents may get to keep that one crosswalk, but, he points out, once the road widening is complete there will be a thirteen-block stretch of six-lane road with only one place to cross safely. “In one sense it’s a victory, in that it is not as bad as what could have happened,” he said. The October 11 hearing was to discuss that particular thirteen-block stretch, but the widening project encompasses most of 24th Street, which is also Highway 178. The plan is to widen and realign 24th Street from west of Highway 99 to east of M Street. The plan also calls for a widening and realigning 23rd Street and widening the intersection at Oak and 24th streets. A complex environmental report and lawsuits filed by a group of citizens delayed the project for years, but the city finally began demolition of homes earlier this year. City Manager Alan Tandy said in an email that they expect to find a contractor in 2018, and that the project will take two years to complete. “This section of street is congested, badly over design capacity, and has about three times the accident level of other similar sections of arterial streets in the city,” Tandy wrote in an email. Tandy wrote that the road allows turns but their radius is tight, and that with speeding cars, stopping for a turn can be dangerous. He said the project will add more lanes as well as a center median to prevent most left turns, and where they are allowed they will be made from turn lanes. The right turns will also be widened so that drivers don’t have to stop to make them, according to Tandy. In short, the new configuration will make drivers feel safe driving even faster, not having to slow for turns or turning vehicles, which will create conditions that are much more dangerous for other users, who will be expected to stay away. Bakersfield is going to put in exactly the kind of highway design that Complete Streets advocates have been trying to convince planners to stop using on local streets. Critics and neighbors have a different perspective. Except for certain times of day, they say, there isn’t enough traffic to warrant the widening. They point to high speeds and the already wide road as the real problem. The decision to remove two crosswalks and replace one also comes right after the city manager’s office released a safety report [PDF] that shows pedestrian fatalities in Bakersfield have been rapidly rising. From 2014 to August 2017, 55 pedestrians and nine bicyclists lost their lives on Bakersfield’s streets. So far in 2017, fifteen pedestrians and two bicyclists have been killed – well on track to surpass last year’s total of sixteen pedestrians and three bicyclists. Tony Dang, executive director of California Walks, said the tone of the data in the report troubles him. It places the fault for these fatalities in most cases on the pedestrians. The report states that 37 pedestrians were killed outside of crosswalks, but crossing outside of crosswalks isn’t necessarily illegal or unsafe. Removing crosswalks removes clear ways for pedestrians to cross busy streets, but it doesn’t remove the need to cross. It only increases the likelihood that rational people, not wanting to walk a mile out of their way, will cross where there is no marked crossing—and thus be “at fault” if there is a collision. “Of course the victim is at fault when they are crossing the street—when you do not provide a safe place to cross,” Dang said. Dang characterizes Bakersfield as a large city that thinks it’s still a small rural town, hanging on to policies haven’t kept up with its growth. The city has grown by adding large subdivisions connected by what were once small roads and are now major arterials. Coupled with the fact that some parts of Bakersfield have no pedestrian infrastructure at all—no sidewalks, no crosswalks, no pedestrian signals—it is no wonder that crashes and fatalities happen. “There is equal responsibility from the city here,” Dang said. The 24th Street crosswalk was not a safe place to cross to begin with—both Dang and Enns agree with the city on that point. The current crosswalk appears right after a curve in 24th, and its paint is faded. There is an overhead flashing light, but it is not enough get a driver’s attention, said Enns. 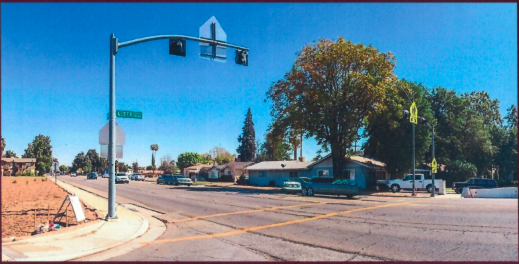 This photo from the staff presentation to the City Council recommending removal of the crosswalks shows the current crossing at Alder/A St.
Dang said you can’t just slap some paint on the road and call it a crosswalk. He pointed out there are additional tools that the city could use—things like a pedestrian hybrid beacon, a refuge island for pedestrians to wait in the middle of the road, or warning signs ahead of the crosswalk. California Walks, along with the University of California Safe Transportation Research & Education Center (SafeTrec) recommended that Bakersfield establish crosswalk installation guidelines to clarify decision-making and prioritization for new crosswalk requests. “We cannot continue to treat pedestrians the way that we have in the past in Bakersfield,” he said. “Research shows if you build a community where it’s not convenient to walk, [people] will find a convenient place to walk, and it might not be safe,” he said. Smart Growth America’s 2016 study Dangerous by Design ranked Bakersfield twelfth out of the twenty most dangerous metro areas for walking in the United States. It is also a Focus City under the U.S. Department of Transportation Federal Highway Administration, part of an initiative aimed at reducing deaths by providing extra resources to the cities and states with the highest pedestrian fatality rates. Dang said the city’s views are starting to change on active transportation, although very slowly. The decision to replace one crosswalk was unanimous, and the city has recently applied for a grant to create a bicycle and pedestrian action plan, which California Walks supported. Gary Enns said he is being vigilant that any new crosswalk design meets the neighborhood’s standards. “You hear about these cities that are all the way at the bottom of lists and they turn things around. Bakersfield can be that city, Bakersfield can be a model city,” Enns said. The city council will discuss the pedestrian and bicycle safety report at its November 1st meeting. Note: GJEL Accident Attorneys regularly sponsors coverage on Streetsblog California. Unless noted in the story, GJEL Accident Attorneys is not consulted for the content or editorial direction of the sponsored content. The consultant is just doing what Tandy asked him to. Tandy’s the criminal. He has a record. Tandy’s a criminal who got nailed for running a frivolous lawsuit against California High Speed Rail with city funding against the express wishes of the city council. Why in God’s name is this crook still City Manager? No worries, I think the fact that a Streetsblog author could forget about this only serves to highlight the extent that NOBODY driving in the state of California is actually actively aware of this. I have a car and even I, much to my shame, have felt like I was in the shameful situation of having to very quickly decide whether it was worse to slam on my breaks or just gun it to clear the intersection for the pedestrian. Seriously. If they’re nervous that dangerous drivers would threaten crossing pedestrians at that point, then make the drivers less dangerous! Narrow the streets, widen sidewalks, add protected bike lanes, plant trees, add bollards and other traffic-slowing devices, etc. Also throw that consultant in jail. That consultant should be dropped and told to never return. I guess they probably can’t throw him jail, but it wouldn’t hurt to check. Not that I, as a pedestrian, would be willing to try to cross and just assume that California drivers will actually know this, but in California, unless there’s a sign explicitly saying not to cross, any intersection is a legal place to cross the street. Removing crosswalks, widening a street which is already too wide, the feeling that drivers would not have enough time to stop. So sad. This could be nice place to live. Widening that street will only attract more traffic and eventually divide the neighborhood completely. Cities that embrace active transportation will thrive in the future. Cities that force 99.7% of all trips into cars will decline.